A few days ago I made these cute roses with black and red stripes and they came out so nicely. I just had to create these cute stripes, dots and roses! It’s actually not a difficult design. 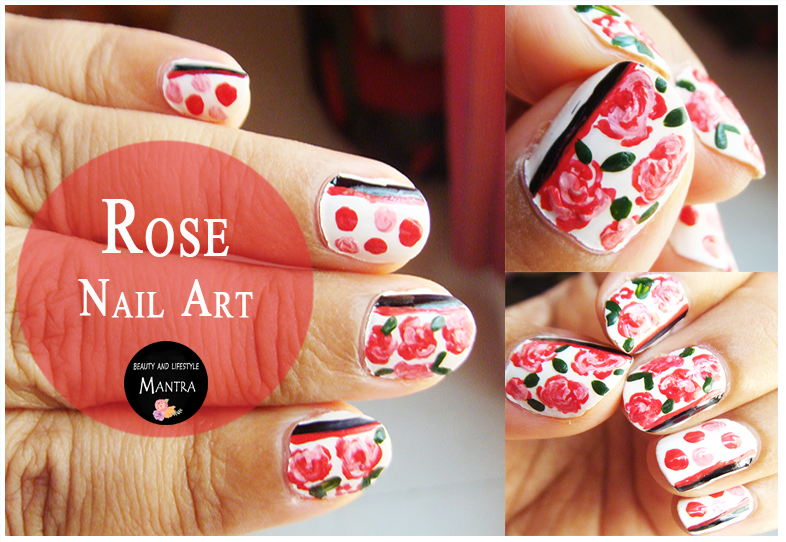 To create these nails you will need a black and white nail polish as well as a pretty green color for leaves and red for the roses. Dotting tool or a toothpick or bobby pin, and paint brushes if you prefer. Paint your nails with white nail polish and allow the nail polish to dry. Once the nail polish is entirely dry then make stripes with black and red. I draw two lines in every nails one in black and other one is red. With a bobby pin, make the polka dots on any two nails. With a bright red color, make larger dot which is the base of your roses. I just made some rough shapes with white color (semi-circular or bigger or smaller comma) of smaller and bigger flowers. White and red color gives pink highlights in between the petals on my roses. Now it's time to add leaves to the flowers. These are done with the paint brushes. That’s it! Finish your nails with a fast drying top coat for glossy looking nails. Let me know what you think in the comments below . It's so pretty. .. and you have done it so perfectly. Jaw drop gorgeous. Awesome, just loved the beauty and the person behind them.